This water-resistant feature is relatively common in Japan, but has not been included in many top-end smartphones released elsewhere. The Xperia Z can also record HDR (high dynamic range) video, a facility borrowed from its camera division. One analyst said it was evidence of Sony Mobile making progress but added "it still had a mountain to climb". The Japanese company announced it was taking control of the smartphone unit - which had previously been a joint venture with Ericsson - in October 2011. Sony posted a full-year loss of 456.7bn yen ($5.7bn; £3.5bn) in May and has continued to lose money over subsequent quarters. The Android-powered device was unveiled at the Consumer Electronics Show in Las Vegas. 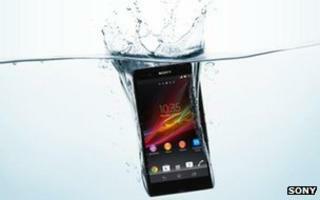 Sony says the handset, which has a 5in (12.7cm) screen, is capable of being submerged in water of up to one metre (3.3 ft) in depth for 30 minutes. "If you want to want to sit in the bath and watch an HD movie this is the device for you," Sony Mobile executive Steve Walker told the BBC. "You can take it in the shower if you want, or more usefully if you get it dirty you can wash it under the tap." He added that about one in 10 people had dropped their phone down a toilet at some point, something this would protect against. The trade-off is that handset's various ports, including the one for its headphones, all feature protective plastic covers that must be unclipped before they can be accessed. Other features on the 7.9mm-thick (0.3in) device include 4G LTE connectivity, a Micro SD slot, a 13 megapixel camera and a 1080p x 1920p high-definition screen that borrows technology from the firm's Bravia TV division to enhance video playback. In addition a NFC (near field communication) chip is used to start streaming content to Sony's latest televisions by tapping the handset against their remote controls. The firm also boasts that the device includes its proprietary Exmor RS image sensor technology, allowing it to record HDR video. This allows it to combine exposure readings to tackle problematic situations such when a person is standing against a bright background; Sony says that without HDR either the person's face looks too dark or the background too light. Nvidia's latest Tegra chip can also do this but has not been built into a handset yet. Ben Wood, an analyst at CCS Insight, noted that Sony's mobile unit is enjoying a recovery, and recently becoming the third best-selling smartphone brand in France, Austria, Switzerland and Sweden. He added that efforts to share designs and technologies across the firm's different divisions would likely be the key to its revival. However, he added that it was too soon to say whether the new handset would be a winner. "In isolation this looks like a very strong product and it's the most attractive Xperia phone that I have seen for a very long time," he said. "But we don't know what this device is going to be competing with this year." "Until we see the next Samsung flagship device and other top-end phones at Mobile World Congress in February it's hard to know how it will do."